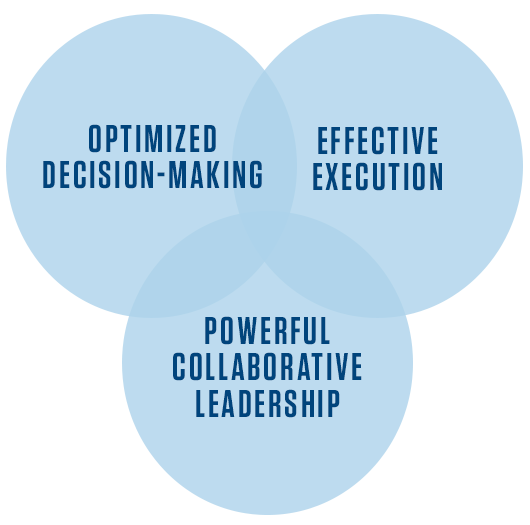 Optimize organizational decision-making and execution through collaborative leadership. Columbia University’s Master of Science in Information and Knowledge Strategy (IKNS) is a leadership development program that produces executives who can optimize organizational decision-making and execution by building and energizing high-performing teams capable of tackling the toughest challenges and greatest opportunities organizations face. Our graduates understand business strategy and can leverage their expertise in collaboration and knowledge sharing across silos to help fulfill mission and vision. Their training translates to increased productivity and impact across all industry, nonprofit, and government sectors. essential skills in collaboration, strategy, business analytics, knowledge development, retention and transfer, information governance and security, innovative digital product design, entrepreneurship, and change management to lead knowledge-driven organizations. a leadership role in all industry, nonprofit, and government sectors. your study by choosing electives from IKNS or one of the other M.S. programs offered by the School of Professional Studies. your career and academic life over 16 months with online classes one weeknight per course, virtual collaboration and discussions, and three four-day residencies on Columbia’s campus in New York City. with faculty who have held leadership positions at global organizations including Accenture, Bain & Company, IBM, NASA, McKinsey & Co., Microsoft, and World Bank. your skills and knowledge through a group capstone project for a leading for-profit or nonprofit organization. the Columbia IKNS network of your global cohort and more than 300 alumni who have advanced in their careers or responsibilities with their IKNS degree at places like ADP, American Express, BCG, Google, Hilton Hotels, JPMorgan, Nike, Pfizer, Publicis, Thomson Reuters, United Nations, USAID, and World Bank. The Vice President and Senior Associate General Counsel at Capital One gained the tools to improve information governance and collaboration at his organization.